It’s been a while since the last Ted’s Threads. I’ve no idea where the time goes. This year has gone by in the blink of an eye and we now have a beautiful one year old who is walking and starting to talk. 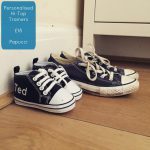 As Ted has grown and developed we have had to consider his clothing and his footwear carefully. We still love good quality garments that look great but his clothes also need to be comfortable and allow him freedom of movement. 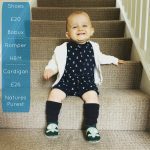 His footwear needs to not only look good but also protect and support his feet as he develops his balance and his walking skills. Over this past year I have really taken a keen interest in Ted’s clothing and I have spent many hours searching the internet for great companies that produce excellent clothing and footwear. Here are a few of our favourites from the last couple of months. Matching his shoes to his blanky! 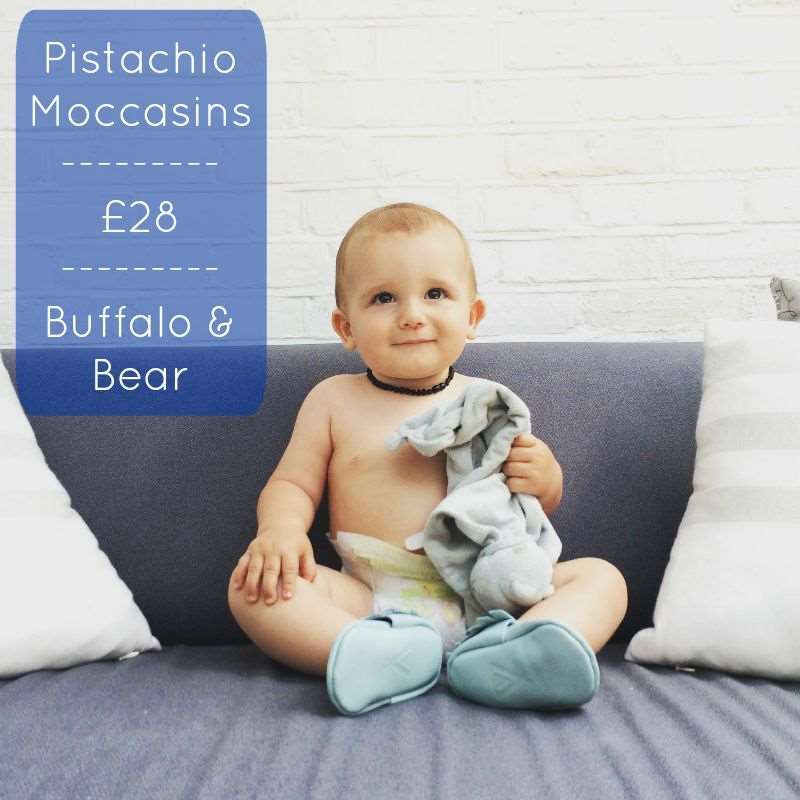 As Ted first learnt to walk these super soft Buffalo and Bear shoes were excellent for protecting his feet whilst being lightweight enough to not hinder movement. They are 100% leather and embossed on the sole by hand. I loved them as they were so easy to get off and on. Ted has a few pairs of moccs and we really like them. This colour is called Pistachio and it goes well with lots of his outfits. We love this dreamcatcher pattern. It’s from Buffalo and Bear’s Sweet Dreams range. You can get matching leggings and bibs and they also make cot sheets. Its printed and made in Britain and is 100% cotton. 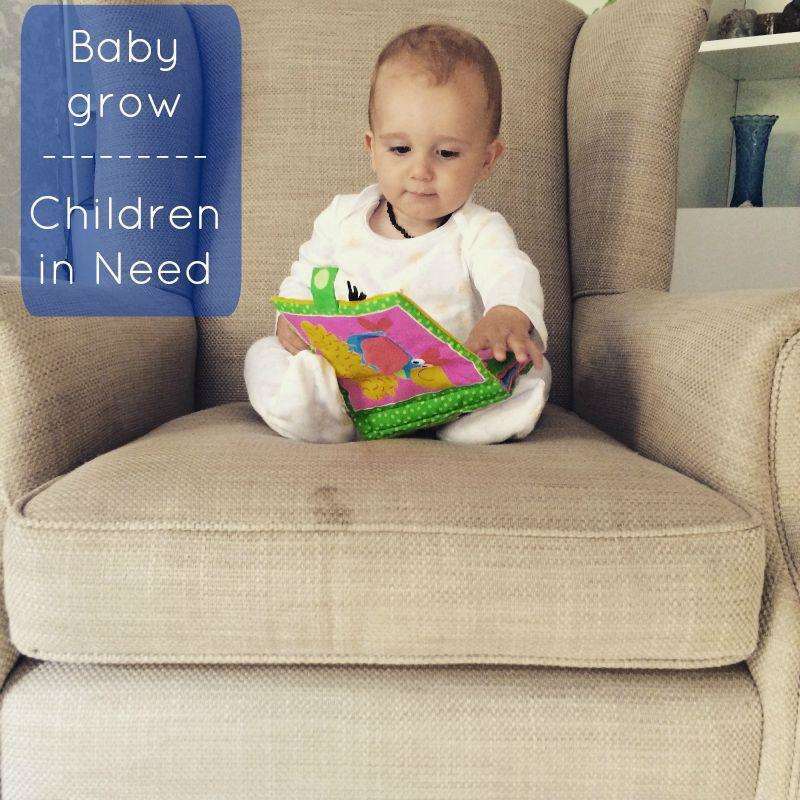 It’s super soft and has a popper fastening system making it easy to get on even the wriggliest baby. 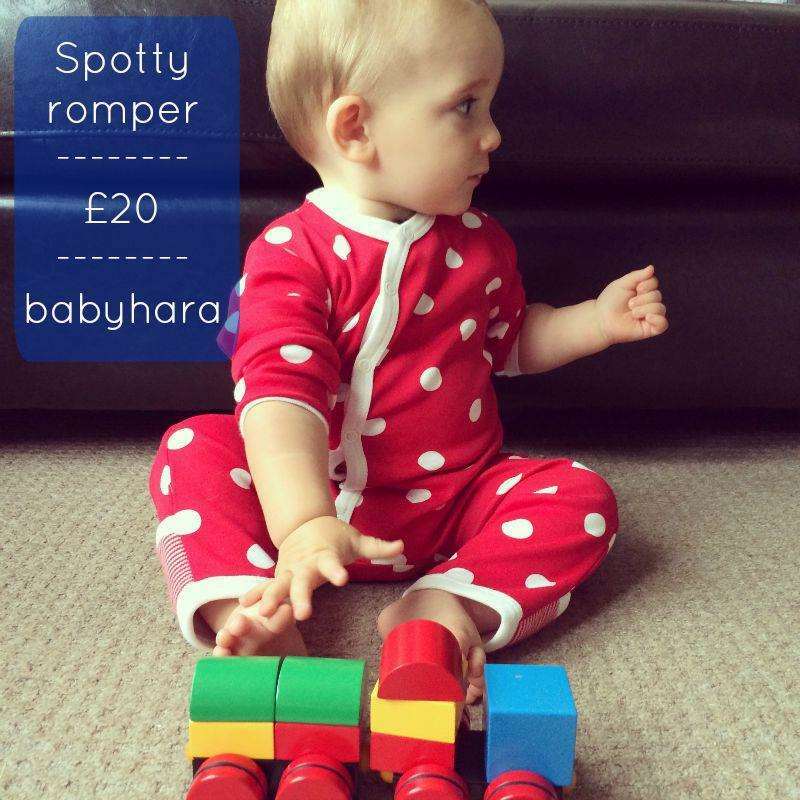 We love this spotty romper from babyhara. It’s so nice to see him in such a bright colour and bold pattern. We are huge fans of baby grows that have fold away feet like this one. It means he can wear it in the day as well as at night. It has kimono style poppers and is super soft. You can also get a body style in the same pattern. 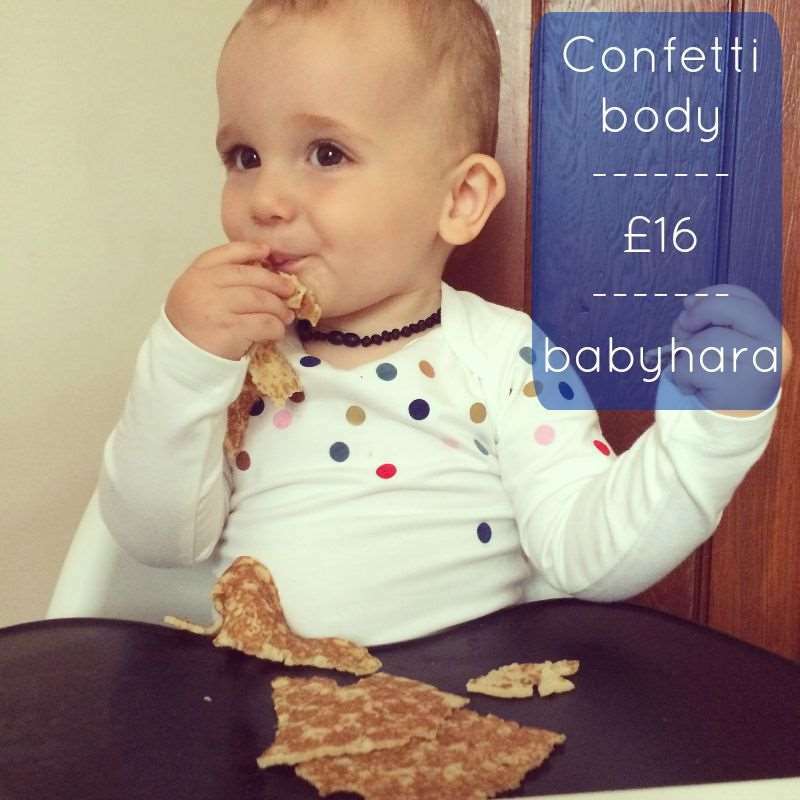 This long sleeved body with confetti pattern is from babyhara too. It matches well with leggings of all colours making it easy to mix and match with. It has soft and metallic print and is made from 95% organic Jersey Cotton. It washes well and the colours stay nice and bright. Here our little Teddy bear is all snugged up in his Pudsey Bear baby grow in support of Children In Need. They do a wide range of products with the Pudsey pattern and can be purchased from the Children in Need online shop. 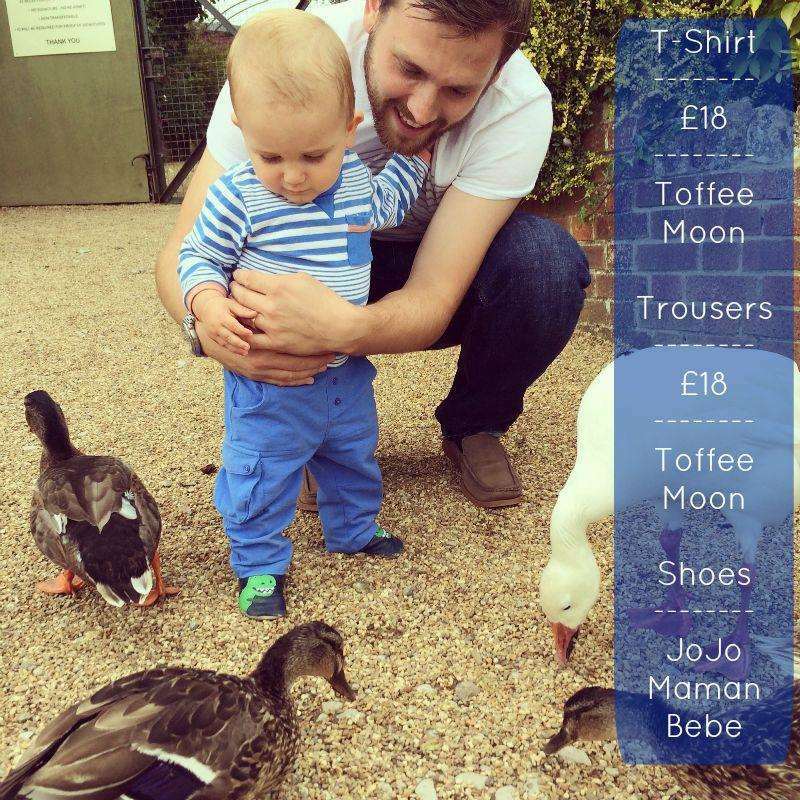 This baby grow is 100% cotton and just £10.75. This photo! How smart does he look? Here he is in the garden of a holiday cottage on the Isle of Wight. You can tell by his face how much he enjoyed it. This beautiful jumper is one of our favourites. 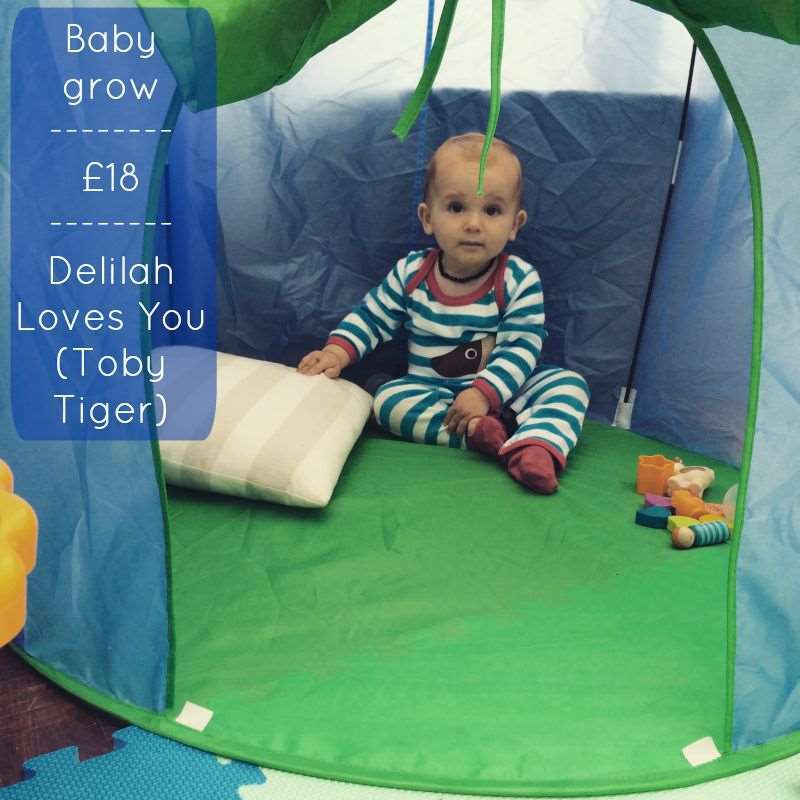 Its from Delilah Loves You and is made from soft cashmere blend. Its pre-washed which apparently means it won’t shrink in the wash. Ours certainly hasn’t. It’s got buttons on the shoulder to make it east to get off and on. I had seen this t-shirt many times on Instagram, printed with the phase ‘Mummy is a blogger’. 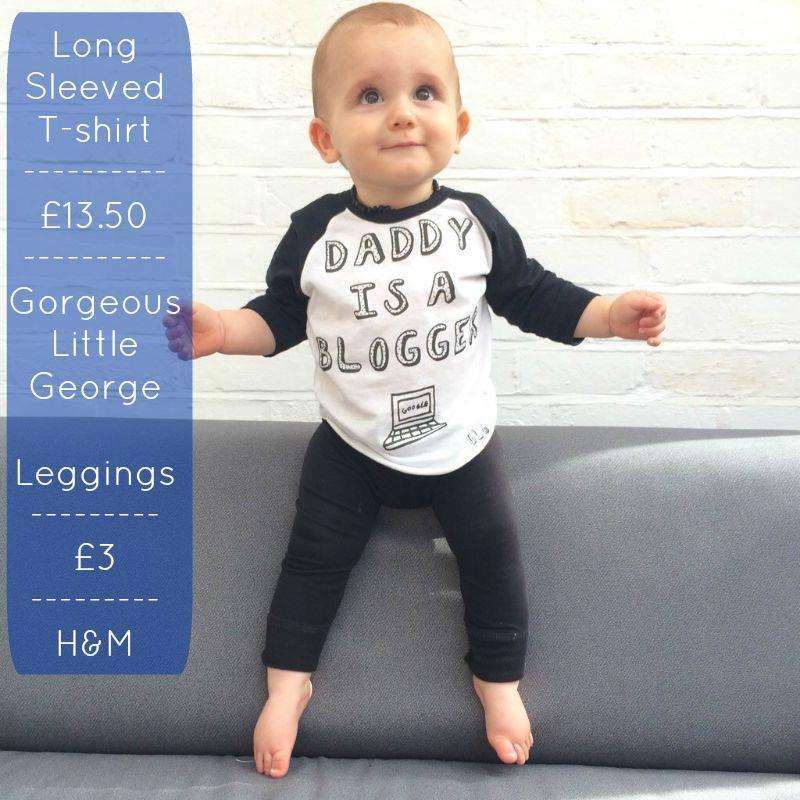 I was so incredibly touched to be sent this ‘Daddy is a blogger’ version by Gorgeous Little George. We were the first to be sent the Daddy version so Teddy is very lucky to be the only boy to have worn one. Yet! I am sure that once they are in stock they will fly off the shelves so if you fancy one, I’d get in quick! I will certainly be buying them for Ted in as many sizes as possible so that he will always have one that fits. 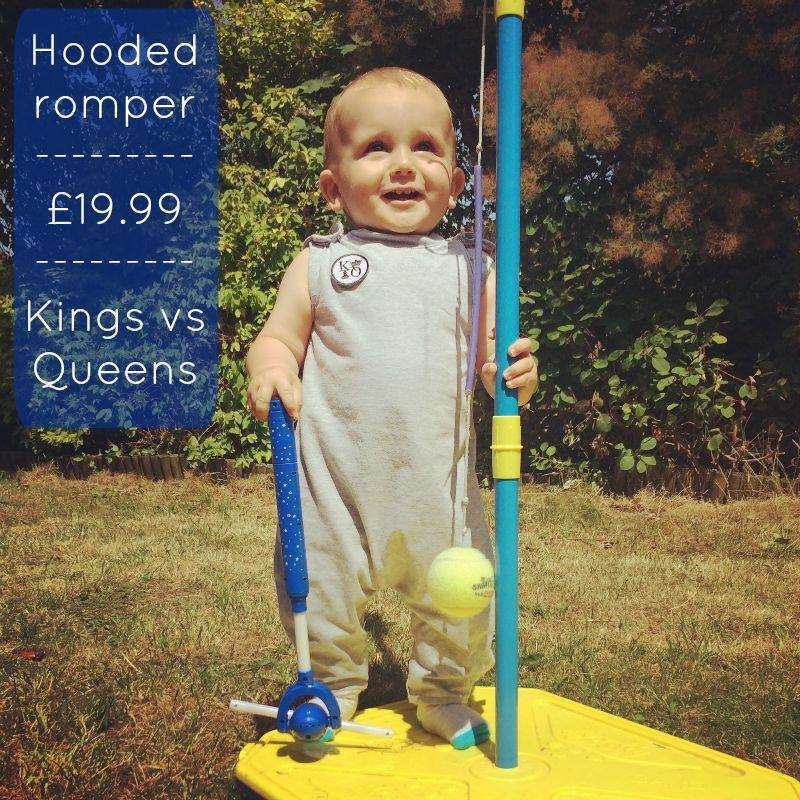 This handmade hooded romper is from Kings vs Queens. Its super soft and looks really comfortable to wear. It has cropped to the knee harem legs. It comes in black and white too. His face! This beautifully bright t-shirt is from Little Squish. 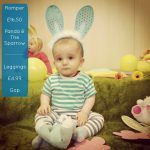 They produce handmade clothing for children from 0-6. Each t-shirt is made in Britain and screen-printed by hand using eco-friendly water-based ink. It washes brilliantly and has kept it’s brightness. 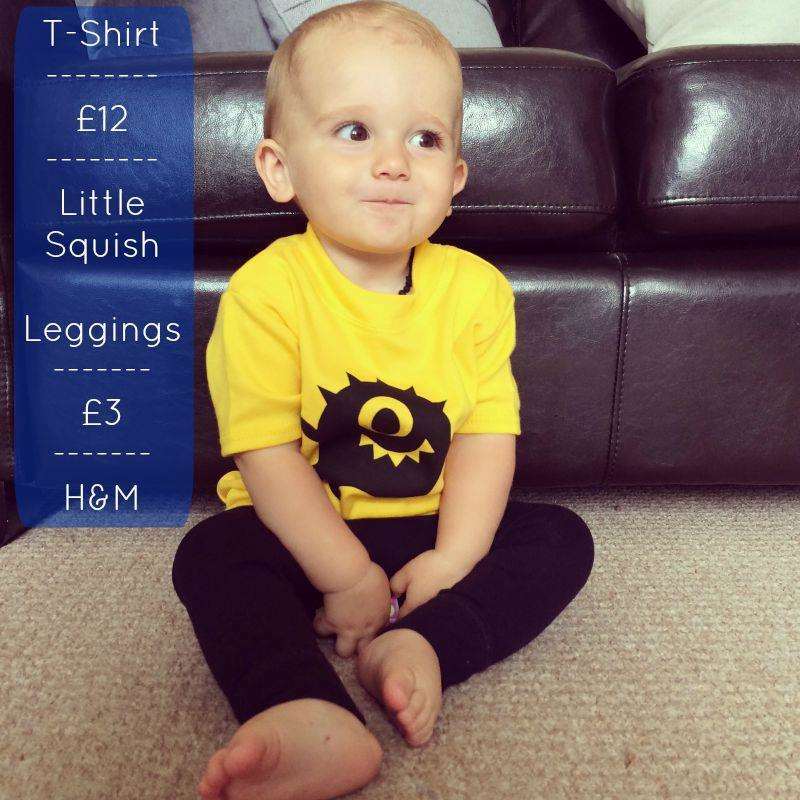 Little Squish also made fantastic numeral t-shirts if you are looking for a birthday t-shirt. As a keen cyclist I have dressed Teddy in a few bicycle and tricycle patterns and this one is a definite favourite. It is from DaisychainBaby and has a zip fastening which makes it so easy to get on and off. I love the added bright yellow detailing. Teddy was sent this beautiful baby grow as a birthday present from Soft Gallery and we love it. It’s super soft but also stretchy as it contains a small amount of Lycra. I love the owl print and the colours. It has popper fastenings and fold over shoulders. It’s a nice tight fit. This sausage dog romper is from Delilah Loves You and it is made from organic cotton. It has an appliqué sausage dog that wraps around the baby grow so that the back shows off the tail. Its super cute and really soft. It has the lovely fold over shoulders that make it easy to get on and off. 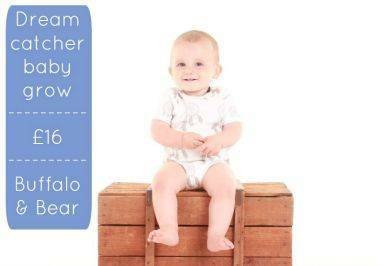 This top and trouser set is now in the sale and can be bought for £10 and £9 from Toffee Moon. They are made from 100% cotton and are incredibly soft. 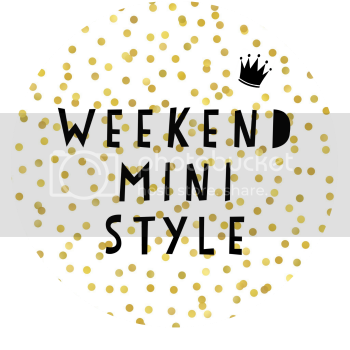 The trousers have an elasticated waist and a cute side pocket for storing the essentials – stones and raisins! The top is also 100% cotton and has a popper opening on the shoulder for easy dressing. And the grand finale…. Ted’s birthday outfit. He had the best birthday a one year old could have wished for. 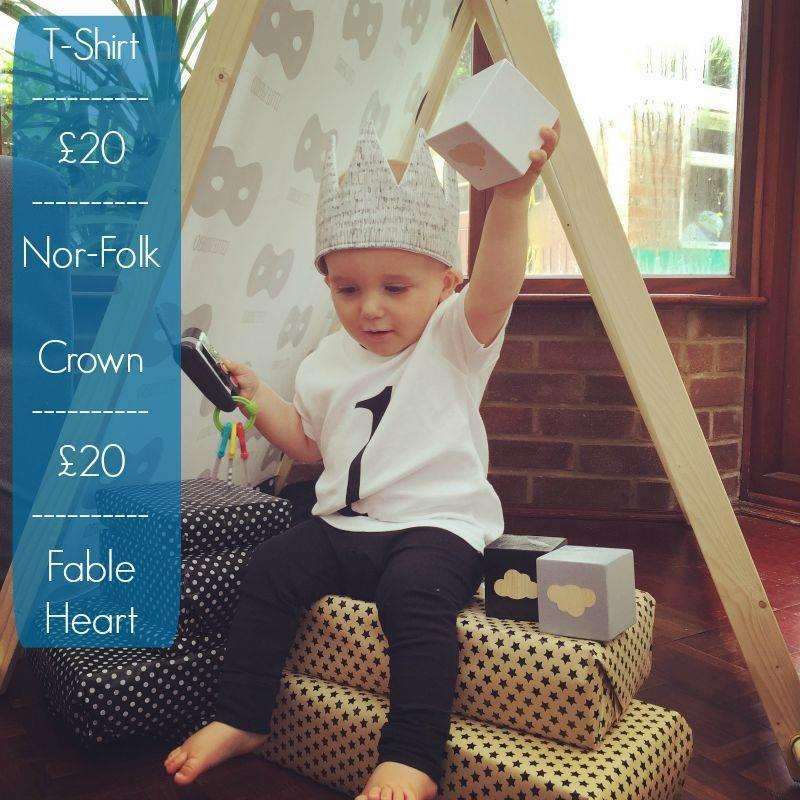 After much deliberating we decided to go for this number 1 t-shirt from Nor-folk which a matching crown from Fable Heart. He looked absolutely gorgeous and didn’t take his crown off ’til bedtime. So, there you have some of our favourites over the past month or so. I could have included many more and look forward to keeping up to date on the next Ted’s Threads. If you have any favourite companies that you think would suit Ted’s style then let us know. I love that fox jumper and the crown is now on my wish list! What a stylish little one! Thanks Helen. It seems to be a popular one! Ah thank you. Where do you shop for him? I’m in love with that owl baby grow! Gorgeous clothes! He looks so cute! What a fashionable baby lol! Ah thank you. He’s def not camera shy! HA! I’ll ask her. It’s a must have! Really do love the red outfit with white dots. I know Jen feels the same about Louis. Hope you are all well. What gorgeous outfits! Ted’s birthday crown is my favourite! I love that you take an interest in what he wears. Ted has the BEST style!! So many gorgeous outfits here!!! 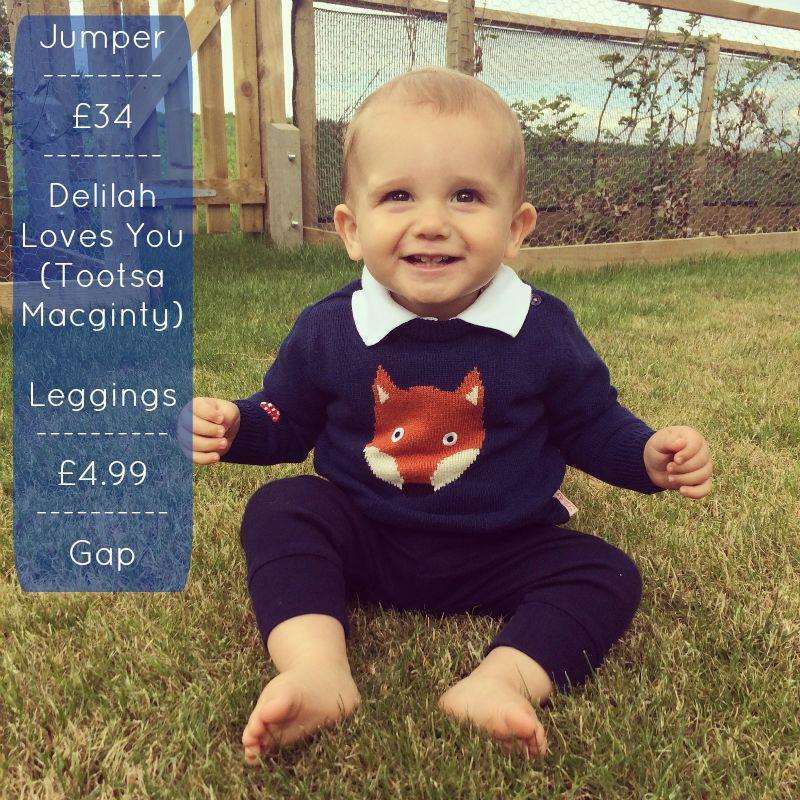 The Tootsa fox jumper is definitely my favourite – I’ve been ogling it for a while now!